These Energized Semiprecious Amethyst is a powerful aid to creative thinking, spiritual awareness and healing. It is believed to ease stress, tension and depression and help combat insomnia .It has the power to help open third eye ,invokes spiritual awareness and awakening. Amethyst crystal is often used by those who are beginning Their spiritual awakening. It is used to access the higher dimension of the self through meditation. Do use for connecting with spirit guides and angels, great for meditation. Some like to place an amethyst on the third eye to focus the energy of this center. The Chakras are the seven power points in the human body that circulate energy or the life force also known as prana. Wear this pendant to clear the energy flow of the chakras. This gorgeous pendant is set with 7 cabochon or faceted chakra semi precious stones on a smart silver colored setting. 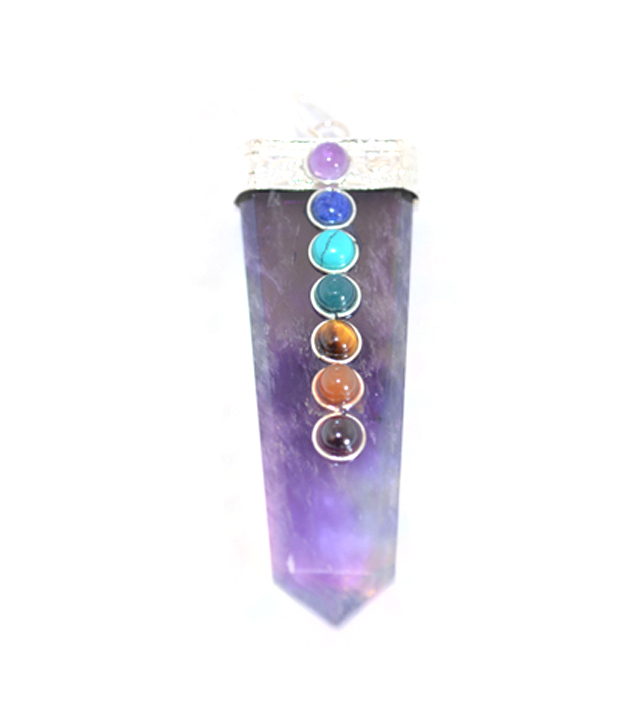 The stones (from top to bottom) are: • Amethyst - Crown chakra • Iolite - Third Eye chakra • Aquamarine - Throat chakra • Peridot - Heart chakra • Citrine - Solar Plexus chakra • Carnelian - Sacral Hara chakra • Garnet - Root chakra Disclaimer: This Fengshui Product is Believed to bring about all the good things. We do not guarantee its success and are not responsible for any claim. Product colour may slightly vary due to photographic lighting sources or your Screen settings.